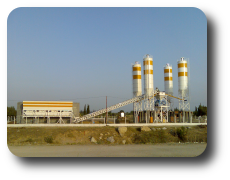 Our firm which is established in 2005 has been manufacturing and selling concrete batching plants, transmixers, concrete pump and their spare parts at its 1000 square meters premise which is located at Saraykoy / Ankara / Turkey. Our goal is to sell products both at homeland and overseas by meeting quality requirement and the customer satisfaction. Selay’s ready concrete plants are designed and manufactured for meeting construction companies’ huge cement requirements for airports’, dams’, industrial plants’ job and the plants producing pre cast cement. Our design criteria is usage capacity, lay out, space available and geographic conditions. All the spare parts for our plants are always available in our stock. Equipments for cement silos, belt conveyors, and mixers spare parts and wearing groups and other spare parts are manufactured, exported and marketed and delivered in abroad as well as Turkey.